In Stehekin we're surrounded by Trees. Douglas-fir, Ponderosa Pine, Big Leaf Maple, Pacific Dogwood, Alder, Western Red Cedar and many others. We love wood. Tell us about the trees growing near you. 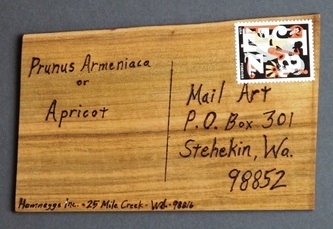 Make a postcard from wood native to your area. Put a stamp on it and send it our way. Label it as to the type of wood and where it came from. Wood from local orchards and other cultivated wood is OK. Our interest is in seeing the grain, feeling the density, smelling the aroma of wood from where you live. Jonathan, the 'Officer in Charge' of our Post Office is a woodworker. He mills his own wood on a bandsaw mill and makes beautiful tables. He sells wood under the name "Yeti Lumber". Jonathan can mill you 2X4's that actually measure 2" X 4". 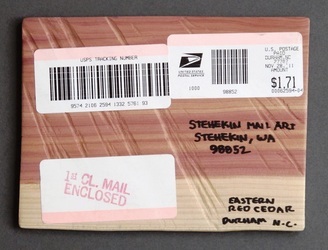 Jonathan has encouraged our mail art and contributed 2 pieces to the "Maps, Animals, Mountains" show (2012). He's made space on the walls of the post office lobby for a wooden postcard gallery. We can't return your postcards. On this website I'll list everybody who sends a card and show a picture of it. 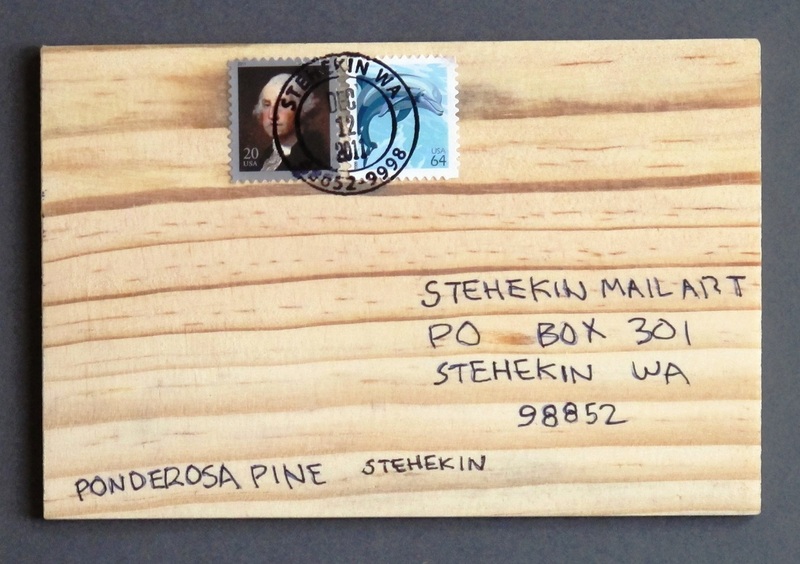 Send as many wooden postcards as you want. Tell your woodworker friends from around the world to send us wooden postcards. 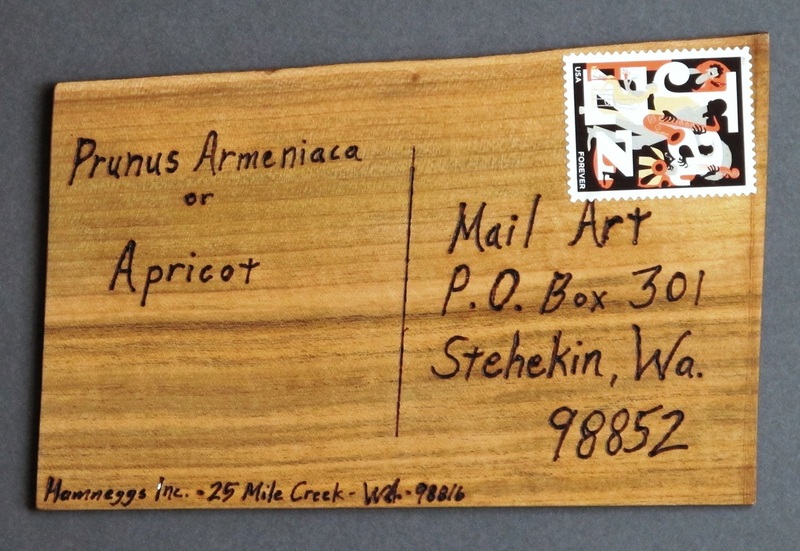 We hope to see postcards made from wood we've never heard of. The show starts now. Keep the postcards coming. The picture of 'Larch Trees in the Fall' on the left at the top of the page is by Keith Brumand-Smith. On the right, "Flick Creek Burn" is by Liz O'Casey.